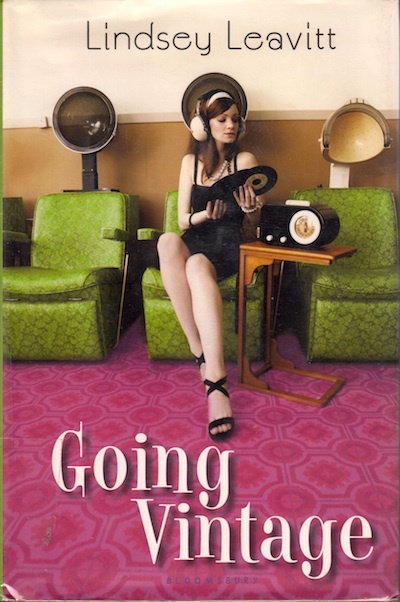 Going Vintage is about a young lady, Mallory, who’s adopted her boyfriend’s life as her own. Which is fine as far as it goes – she was new to the area and met and fell in love with him before she made a lot of other friends. It’s realistic if not particularly feminist. But then he cheats on her online. So she dumps him and goes fully retro: everything must be from the mid-60s. Mallory starts a pep club and hosts a dinner party and only wears her grandmother’s vintage outfits. Her helpful sister takes all of her technology away – she’s not allowed her phone or anything that wouldn’t have existed in the mid-1960’s. She rides her bike to get places and has to buy a fully corded phone. But it’s never portrayed as better – in fact, much of the time, it’s about how inconvenient life used to be. The idea of comparing and contrasting life in the past with now is one that warms my heart. What was better before the internet? What was worse? I like that the author doesn’t sugar-coat the nostalgia, but I wish she hadn’t been quite so pessimistic. None of Mallory’s friends can figure out her phone number and call her? It’s like it was an excuse for the author to not flesh out any of those side characters. That aside, it’s a cute story for anyone who likes a dose of YA, but you won’t remember it in two months.